Hailing from the late 1800s is this floral repousse water pitcher from Tiffany & Company that shows elegance. 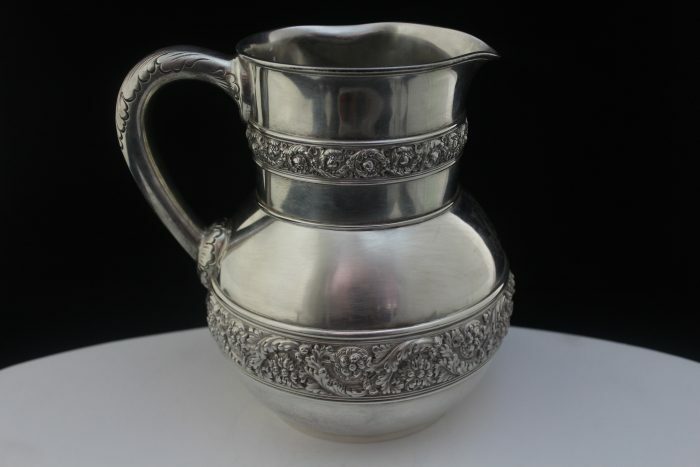 An antique part of history, this vintage sterling silver pitcher has two bands of scrolling floral blossom that covering 20% of its surface as well as the inside of the pitcher. The pitcher shows small signs of wear as well as scratches on the bottom, due to it’s age and use.